The holidays have a way of harrowing the soul. Irrespective of the kaleidoscope of lights and the shimmering potentialities of wrapped presents, something cold and ragged claws at our thoughts. Similar to how November strips the trees bare, the holidays have a knack for pulling away our protective canopies and leaving us emotionally exposed, feeling the chill of a world not as it should be. And like December’s descending winds, the holidays blow by us with jingles of merriment, visions of warm festivities and awaited gifts—but often leave us shivering in their wake, feeling colder for the discord, colder for the want of things that are not. There is an inherent dissonance in the holidays because they are exactly that: holy days. They are days that speak of holiness—the complete otherness and consuming, infinite worth of the God who self-designates as the I Am that I Am. The Wholly Other One Who Is. They are days that speak of this blazing fire of love and how he has ordered the world, how he has invaded the world, and is now reconciling the world to himself through the Good News of Jesus. But this fleeting sense of holiness haunts our days—for our days are also days of unholy desires, self-sick motions; days of melancholy wrapping our necks like scarves of wet wool; days of chemotherapy laying waste to our bodies, thinning us to the bones beneath; days of ennui that a Technicolor array of entertainments just can’t seem to dispel; days of loneliness amongst the crowds; days of remembering what it was like to hold your newborn’s perfectly fashioned hand moments after he took his last breath. Today is December 5th, 2016. Haven, my firstborn son would have been five years old today—talking incessantly, roughhousing with new toys, leading his younger siblings in building and destroying couch-cushion fortresses, and taking an afternoon nap as excitement collapses into adrenaline exhaustion. But there is no party today. Only the yearly ritual of a slow-motion morning, swell-waves of tears, clumsily fitting together fragmented memories with my wife, struggling through ruthless what-ifs, and then wading through a photo book of the one morning we spent with our son. His eyes closed in every picture, the inexorable question of their color comes to mind over and again. Would they have been emerald like my wife’s, or a greyer set of tones like my own? 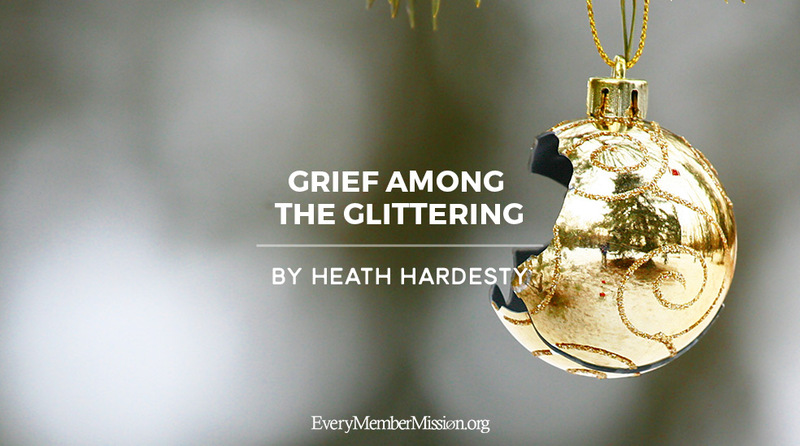 For me, like so many others, December holds untold grief. But death’s hammer-strike upon my heart has excavated a gold vein that I find sinks into the deepest bedrock of my being. Hope survives, converges, and rises amidst the grief. Danish philosopher, idiosyncratic author, and all around curious thinker Soren Kierkegaard has often been a walking companion for me in sojourning through the badlands of this world. As is often is the case with my dear old friend Soren, he takes me by bittersweet surprise. As Kierkegaard parabolically points out, one of the veiled joys of grief, if I may state it so strangely, is that grief blows in and extinguishes all the lanterns of comfort and distraction we have tried so industriously to keep lit. It is in those instances of in-rushing fear when all lantern-light is snuffed out that one’s heart is suddenly, unexpectedly impressed with the guiding beauty of God’s starlight. And in a world where our default guiding star is our own frail voice saying, “I must take care of myself; I must light the way,” there is no greater relief than to drop our blackened and broken matches, look up into the vault of heaven and say, “What is man that you are mindful of him, and the son of man that you care for him?” (Psalm 8:4) Under God’s glorious jurisdiction, every grief can be a severe mercy. These are holy days—days that turn our attention to the Christ child, born roughly in the cold of night, writhing blood and flesh placed in the mean estate of a manger. God caught in the travail and confusion of being born—infant eyes taking in a swirl of strange information. Swaddled and sovereign—unthinkable and wonderful! These are holy days that tell the tale of heaven’s invasion into a dark and battered earth. Days that say, “Rejoice! For this babe was born that man no more may die. Rejoice! For this child’s cradle leads to a cross, and the cross an overture to an emptied grave and a chorus of angels around the King’s triumphant throne. Thank you for this God glorifying message. I came across your posting as a link from Irresistible church. I have a 20 year old severely autistic adorable son and run a club in our church in Belfast for children and young people with severe learning difficulties. My father died 7 weeks ago after suffering many months of illness. He faded before my eyes. While we know he is safe with our dear Saviour in heaven these days leading up to Christmas feel sad without him. He loved greatly and was greatly loved. I was deeply moved by your post and understand a little of your aching heart. Thank you again for the wise words which I will pass on to others. God bless you as you minister to many in need of God’s forgiveness and love.